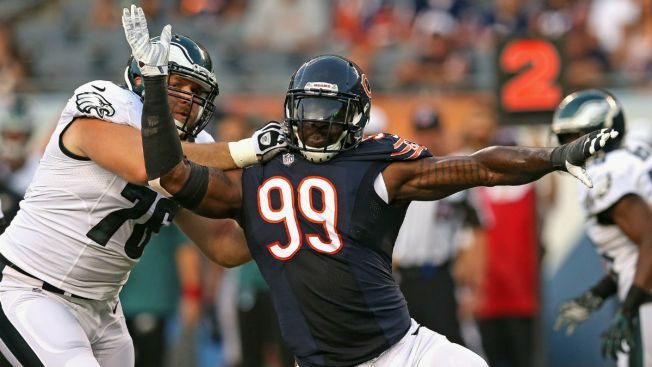 Just before the start of the regular season, the Chicago Bears parted ways with linebacker Lamarr Houston, but that apparently wasn't the end of his time in the Windy City. That’s because the Bears claimed Houston on waivers from the Houston Texans on Wednesday, the team announced. Houston, who signed with Houston after he was released by the Bears, registered a sack and six tackles with the Texans in five games, and also returned a fumble for a touchdown. On Tuesday, Houston was released by the Texans, although reports from NFL Network’s Ian Rapoport and others indicated that the move wasn’t made because of poor play. The Bears had an open roster spot after releasing wide receiver Tre McBride on Monday afternoon, so no corresponding roster move was necessary. During his first go-round with the Bears, Houston registered nine sacks and picked up 46 tackles. His tenure was marked by injuries however, including a torn ACL that he suffered while celebrating a sack against the New England Patriots in 2014. Houston was released by the Bears before the regular season after suffering a minor knee injury in the team’s final preseason game.